Hydraulic Series Coupon Holders are designed to be specifically compatible with high pressure hydraulic access systems. The coupon holder is attached to the solid plug assembly by means of a left-handed thread connection. Coupon holders are manufactured from 316L stainless steel to meet NACE MR-0175 requirements for sour service. Mounting hardware is also manufactured from stainless steel and is supplied with coupon holders. Insulators are fabricated from Nylon and are supplied with the coupons. Coupons are ordered separately. Calculated lengths are rounded down to the nearest 1/8". Strip coupon holders are designed to suspend a pair of 3" or 6" coupons in a vessel or pipe. After selecting the access fitting body style to be used, determine the pipe or pressure vessel size and select the coupon length and line position where the coupon will be located. Coupon holders can be sized to monitor the top, middle, or bottom of the line. Use the following formulas to calculate the required holder length. Top-of-the-line Monitoring: L = PW + 2.75"
One half of the coupon extends into the pipe and the process environment. The other half is positioned in the access fitting body cavity and may be used to monitor the formation of gas pockets. The coupon is centered so that ½ of the coupon is positioned on either side of the pipe’s centerline. The coupon is positioned approximately ¼" off the bottom of the line. Top-of-the-line Monitoring: L = (FG + MH + PW) + 2.75"
They can be mounted flush with the pipe wall so that process effects occurring at the pipe wall are closely simulated. Holders properly sized to the flush position prevent coupon interference with pigging operations. Orientation of coupons to process flow is not required. The fixed length flush disc coupon holder may be sized so that the coupon is positioned flush with the pipe wall, or is extended into the line at the top, center, or bottom position. Disc holder lengths start at 2.75" and are available in 1/8" increments. The holder's adjustable rod allows for a total travel length of 1.5". Example: A 3.25" holder would be adjustable from 3.25 to 4.75 inches. Select the access fitting body style and determine the pipe or vessel size and line position where the coupon will be located. Then use the appropriate formula below to calculate the required fixed length disc coupon holder. The coupon is positioned approximately 1⁄4" off the bottom of the line. 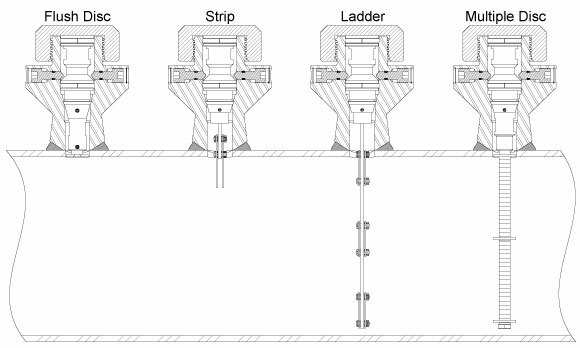 Flush Monitoring: L = PW + FG + MH + 2.75"
Middle-of-the-Line Monitoring: L = FG + MH + 1⁄2 OD + 2.625"
Ladder strip coupon holders are designed to simultaneously monitor corrosion at various levels in a process line. This is a technique employed in large diameter pipelines (8" O.D. and greater) where corrosion may not be uniform across the diameter of the pipe, or in systems where flow is stratified. Multiple Disc Coupon Holders are suitable for pipes with O.D. greater than 6.00". Multiple Disc Holders allow coupons to be placed at a specific level in multi-phase or stratified flow. The coupons are insulated from the holder rod by Delrin Shoulder Washers. Delrin Spacers are used to provide insulation between coupons. Materials of construction satisfy the requirements of NACE MR-0175. The coupon is positioned approximately 1⁄4" off the bottom of the line.